Chicken sausage is so popular at my local Trader Joe's grocery store. It seems like there's always a new flavor combination on the shelf with colorful packaging that tempts me. As I was walking through the store recently, I started to think about chicken sausage, which lead to pork sausage, which lead to pork meatballs and at that point, I caught myself wandering in thought and tried to remember what started it all - chicken sausage. Then it occurred to me that I haven't seen packaged chicken meatballs too often. Well, as you might assume, thoughts of chicken meatballs lead to chicken sausages and flavor combinations... why not make similar chicken sausage flavors into meatballs? That's how the idea of this recipe came about. One of my favorite chicken sausage flavors is chicken and apple. And because everything is better with cheese, I added some cheddar cheese to the mix. You can prepare this mixture into sausage patties, burgers or meatballs - whatever you'd like or as you see fit! I recently made this chicken, cheddar & apple mixture for the recent Eli's Cheesecake Festival and I saved some to use in other applications aside from meatballs. One of those ways is to use the mixture and stuff them into mushroom caps. Mushroom caps are nice appetizer and can even be served as a side dish. You can use your choice of standard white button mushrooms but these work just as well with cremini mushrooms too. 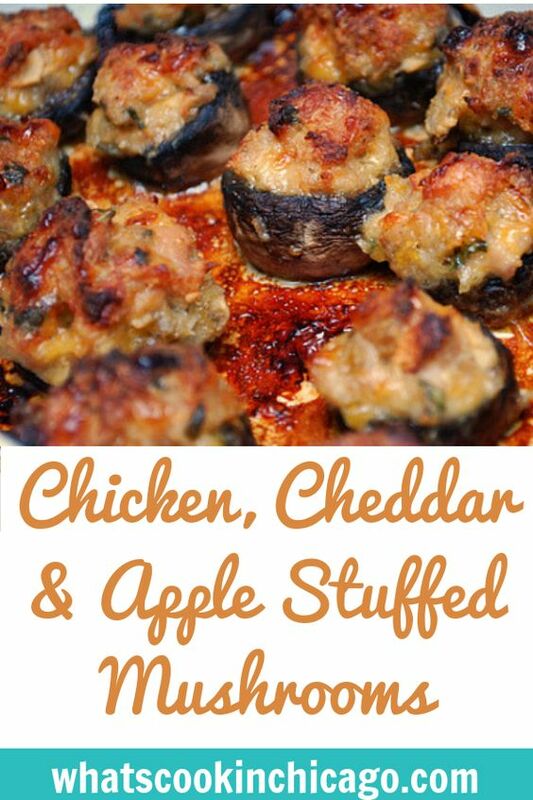 If you're looking for a different twist on stuffed mushrooms, give this a try! Peel and core the apples and place on a cookie sheet. Drizzle with olive oil and sprinkle salt to taste. Bake in the preheated oven for 30 minutes to roast. Remove apples from the oven (don't turn oven off) and place in a food processor. Process until finely chopped; set aside. Prepare your mushrooms for stuffing by brushing off any dirt and removing the stems. Carefully spoon the chicken mixture into the mushroom caps to fill. Place filled mushroom caps in a baking dish and bake uncovered in the preheated oven for 15-20 minutes. (Alternately, you can place the filled mushroom caps on a mini muffin pan, one mushroom cap to each well.) Remove from oven and serve hot as an appetizer or even a side dish. Oh my this looks fabulous! Perfect for the fall season. 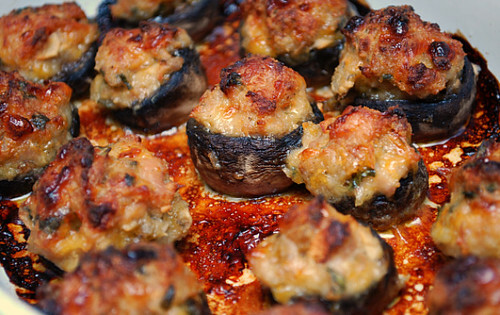 I ADORE stuffed mushrooms, and yours look like they would be very hard to resist! Wow! YUM! Those look great!! I'm going to try this with the chunky applesauce. Do I still put it in the food processor? Your recipe says to process the roasted apples til fine.